Hanukkah is a Jewish holiday that is celebrated for eight days and eight nights. It is also known as the Festival of Lights and the Feast of Dedication. Although most commonly observed in December, it has a few times taken place in November, even coinciding with the Thanksgiving holiday. This year it will begin on the evening of December 2nd and will finish on the evening of December 10th. In 200 B.C. Antiochus III, the king of Syria took over Judea, and under his rule, the people were given the freedom to continue their religious practices. It wasn’t until his son Antiochus IV took over that things began to change. The Jewish religion was banned, and the Jewish people were forced to worship Greek Gods. His soldiers attacked Jerusalem in 168 B.C. ; they destroyed the city, killing many. The city’s Second Temple was desecrated by them building an altar to Zeus, and making big sacrifices. Mattathias, a Jewish priest, started an uprising with his five sons. The rebellion grew in number, and by 166 B.C. the Syrians were eventually defeated. The Second Temple was cleansed, the altar was rebuilt, and the menorah was lit. At first, it appeared that there was only enough oil for the candles to burn for one night, but the candles managed to burn for eight days and nights, giving them a chance to make more oil. From this wondrous miracle, the celebration of Hanukkah was born. The lighting of the menorah is the most significant part of the holiday. 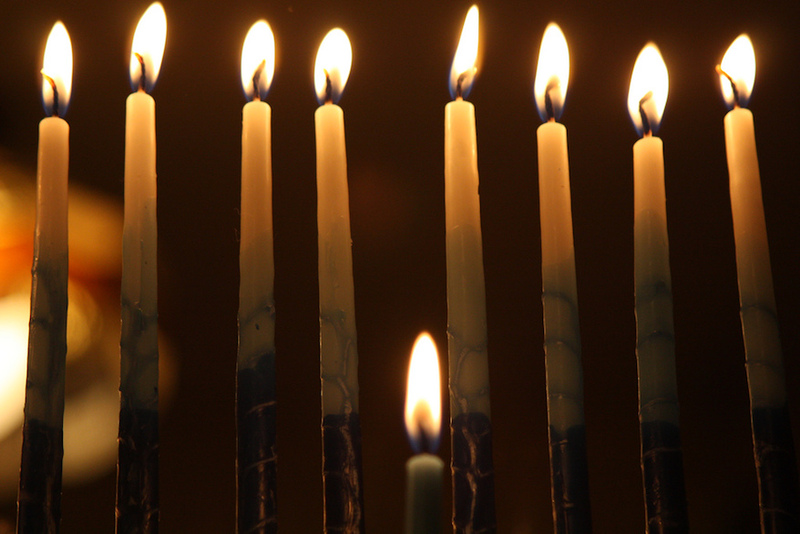 There are nine candles, the shamash (which means attendant) is used to light the other eight. Each night a candle is lit until by the eighth night all of the candles are lit. This is done to honor the miracle that took place in Jerusalem all those years ago. It varies from house to house who lights the menorah; some even have a menorah for each member of their family. The menorah is generally placed in either a doorway or a window, and is lit most often after sunset, and will burn for thirty minutes. A blessing is recited before the menorah is lit and afterward hymns are sung. Another way that the oil miracle is honored is by partaking of foods that are fried in oil. Latkes (potato pancakes) and sufganya (jelly-filled donuts) are two of the most common foods that are eaten during Hanukkah. A game with a dreidel is commonly played. A dreidel is a spinning top that has four sides, with Hebrew letters on each side. The four letters make up an acronym for the Hebrew phrase “nes gadol hayah sham” which translates as “a great miracle happened there.” The game consists of playing for a variety of items: coins, chocolate coins, and nuts. These items are divvied out equally to each player. Each player places one of their items into the pot, and the game begins. When the dreidel is spun and lands on a specific side, the spinner of the dreidel will either win one of the items, all of the items, or have to add an item to the pot. Once a player loses all of their items they are out of the game. When there is only a single player left, the game is over. Hanukkah is not a “Sabbath-like” holiday, therefore, is no obligation to refrain from activities that are forbidden on the Sabbath, often Saturday. Families go to work and school as usual but may leave early in order to be home to kindle the lights at nightfall. Many families exchange gifts each night, such as books or games, and “Hanukkah Gelt” is often given to children. However you celebrate, we wish you a joyous Hanukkah with your loved ones.